Read-out Instrumentation Signpost: Stepping stone between wireless sensor and IT system. Stepping stone between wireless sensor and IT system. The Sensor Bridge from .steute's "Wireless" business unit is a new and key component for its wireless network sWave-NET®. As a classic middleware, this software interface processes all messages received from wireless switching devices in the field and bundled by access points. The Sensor Bridge then relays these messages to applications registered specifically for this purpose. 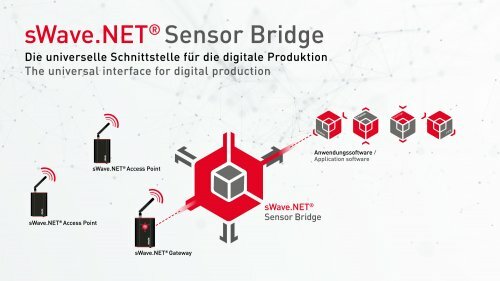 Installation of the sWave.NET® Sensor Bridge in a factory closes the gap between the high security requirements of a production hall on the one hand, and the integrated world of digital services on the other. The Sensor Bridge acts as a "translator" between different protocols and the administration level of the sWave.NET® wireless network. Simplified data integration, safe local pre-processing, as well as detailed statistics of use, are further functions of the Sensor Bridge, qualifying it as a central data hub for state-of-the-art production environments and digital business models in industry. Thanks to the universal connectivity of the interface, the sWave.NET® Sensor Bridge can be integrated in every kind of production environment. The range of supported protocols is continually growing and currently includes e.g. REST (XML/json), http(s) Notifications and MODBUS TCP, all without the need for additional hardware. First applications for the sWave.NET® Sensor Bridge are being realised in E-Kanban systems and in the communication between automated guided vehicles (AGV) and their superordinate control systems.